New Bike for the Newbie! Hey guys, I'm new here. actually I'm pretty new to dirtbiking. I've spent the last 20 years riding quads. 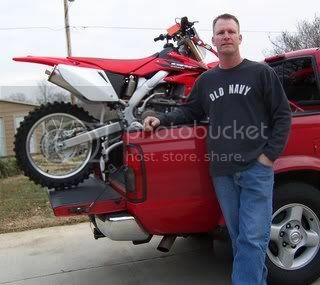 Don't get me wrong, I still love my quad, but I also like branching out and riding bikes too. Last edited by zooomer on Mon Dec 24, 2007 5:35 am, edited 4 times in total. you used the wrong code i think. it looks okay but is not showing. dam u beat me to it. welcome to the site, and welcome to dirt biking. zak13 wrote: dam u beat me to it. wat, is ur son going to ride that 250x. Welcome to the site Zoomer. This place will defiantly help you with pretty much all question you might have. That is one sharp looking bike. Congrats. Welcome again. There is plenty of time to sleep when your dead....... Ride Hard!!! Welcome to the site Zooooomer!!! "Make a man a fire and he'll be warm for a day. Light a man on fire and he'll be warm for the rest of his life." ~ wrote: Welcome to the site Zooooomer!!! Welcome zoomer. Don't believe Agent Smiths apology. He gets off on bagging on quads! Welcome from the dark side. Read the forums and mod that 250X! Don't be afraid to alter a new machine. It will be so much better and you will love it even more. yea dont leave it stock, rejet, do sum small mods like the pink wire mod, maybe even get a new exhaust, if not do what most people with x's do remove the baffle, get a new air filter, set the suspension, get a better chain, get sum grips, i know that all sounds pricey but its not, do em in slow steps and sooner or later youll have your very own race machine. the first thing you gotta do is get sum #'s. I've gotta learn how to ride this thing before I do many mods to it. Here is my sons bike and mine. sweet, what kinda riding are u gunna be doing, i still think you should do stuff like set up your suspension and rejet it will be so easier on your self and the bike. you should look in to getting your son a new bike that 70s pretty cool but he looks as if he could use a 65 or sumthing. just my opinion. The mods will make it better, but the minimal you should do is set your race sag! You look pretty trim. What is your weight? The bikes are sprung for about 170 or so. If you are there then set that race sage and don't look back. If you are like most of us and are 200 plus, then seriously begin thinking about getting your suspension re-sprung or re-spring and re-valved. Nice looking boy, and 70! 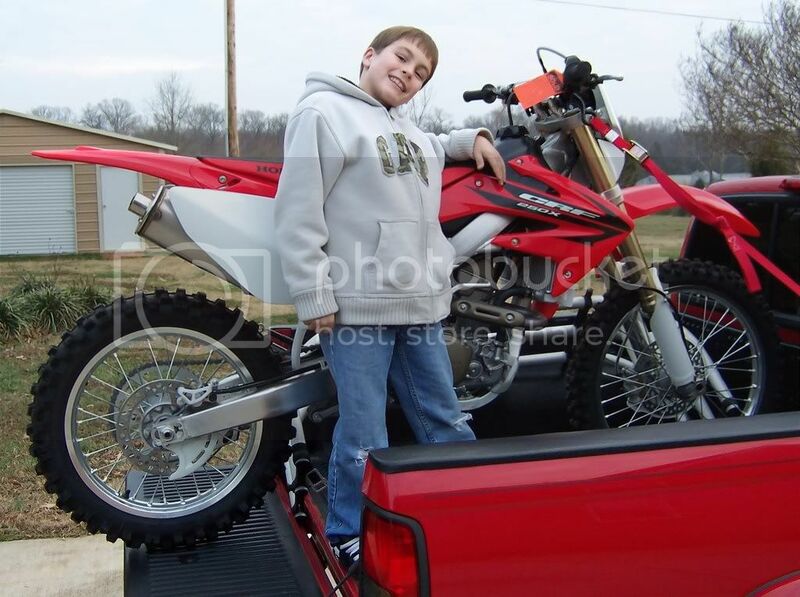 I have a 450X and my Grandson rides the 70.